There are some amazing Tunis tours that will show you around Tunisia’s capital city. Some of the top sites include the Bardo Museum, Zitouna Mosque and the Tunis Medina. There are also some excellent day trips from Tunis. I recommend that you take a trip out to Carthage, which was the centre of the ancient Carthaginian civilization. Tunis is the capital and also the largest city in Tunisia, sitting on the Mediterranean Sea and close to the Lake of Tunis. The heart of the city is the ancient medina which is a World Heritage Site. Tunis is the political and administrative centre of the country but also the cultural centre. Tunis started out as Berber settlement close to the ruins of ancient Carthage and became a crossroads between caravan and port traffic. The Arab Muslims conquered the area in the 7th century and this was when the medina was created. It became the chief naval base on the Mediterranean. Around this time, the oldest of the city’s mosques, the Al-Zaytuna Mosque, was founded. The modern city is a mixture of historic buildings and newer additions, parks and museums that make it an interesting place to visit! Tunis is a perfect central location to tour many of the historic locations in the area and this tour covers two of the main ones. The Roman archaeological site of Dougga includes the Theatre which was built in 168AD by one of the wealthy occupants. See the Lician Baths and the residential quarter as well as some great spots to take pictures of modern Tunis. Then finally, carry on to Bulla Regia where you can see an amazing Roman villa that has been preserved and restored. The tour lasts around eight hours and includes ‘skip the queue’ passes for easy access to the attractions. Even if you aren’t a huge history fan, I bet you have heard of Carthage, the city who once took on the might of Rome. The remains of Carthage are just 25 minutes’ drive from Tunis, so this tour is an ideal way to visit them while staying in the capital. Carthage was finally destroyed by the Romans in 146BC, but excavations have shown homes, the city walls and even the sewage system. The trip to Carthage is a chance to see some of the most spectacular modern villas in Tunisia and then it carries on to the UNESCO listed site, Sidi Bou Said. This blue and white village on the Mediterranean coast is a popular tourist spot and the tour includes a visit to a local museum. On the return trip, you will stop off at the Bardo National Museum with its Roman mosaics and collection of rate Phoenician artefacts. It lasts 8 hours and includes skip the queue access to the attractions. Sometimes, you want a little break from all that amazing history and beautiful landscape. That’s where activities come in – a chance to do something different between those sightseeing experiences. This six hour experience is a great chance to learn more about traditional Tunisian cuisine and to create classic courses and salads. The class starts with a visit to the food and spice markets then the class begins. It is suitable for all abilities and involves working with a traditional Tunisian chef. You will learn about preparing the components of the meal, tailoring it to your own tastes and work at a pace that suits you. If you are staying on Tunis for longer than a few days, then it is definitely worth looking at some of the longer tours. These are a great way to see a number of different locations and must-see sites of Tunisia, all while being with an experienced and knowledgeable guide. This five day tour operates from a four star hotel in the Hammamet Yasmine resort. It includes a visit to Nabeul, with its Spanish Fort and weekly market which is a great place to grab some souvenirs. The next day is the big sightseeing day – it includes the ruins of Carthage, Sidi Bou Said and the Bardo National Museum. The fourth day includes visiting the ancient town of Zaghouan as well as Dougga and the Berber village of Turbo Majus. On the final day, you have transfers back to Tunis Airport. If you love a combination of history, stunning scenery and modern Tunisian life, this is the tour for you. It starts with a visit to the El Djem Roman amphitheatre then on to the Aghlabid basins and the Grand Mosque, the oldest mosque in North Africa. The second day involves a trip to Chebika and Tamerza with their waterfalls and the natural wonder of Mides Canyons. The third day is a chance to see the Sahara Desert and to spend an evening in a luxury campsite with a traditional meal. On the fourth day, you will see the famous underground structures of the Troglodyte Berber town where many people still live. Then finally, enjoy some souvenir shopping in the Jara Souk. The tour includes 4 nights accommodation and all entrance fees as well as a professional guide and driver. This is an eight day tour that includes the very best archaeological sites across Tunisia from a base in Tunis. 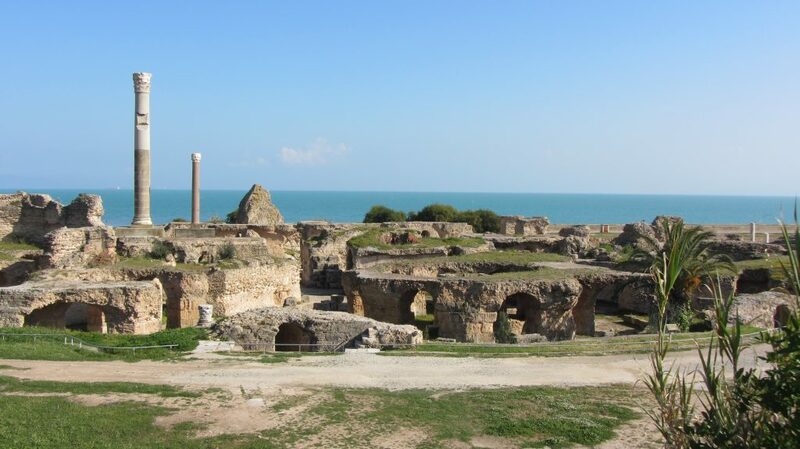 The tour starts with a visit to the ruins of Carthage, famous for its conflicts with Ancient Rome. See the Punic Port, the Antonine Baths and the Colosseum then visit the picturesque village of Sidi Bou Said. The tour also includes key sites such as Bulla Regia, Dougga and the Medina at le Kef. See the remains of the Numidian wall at Maktar before moving on to the Grand Mosque at El Jem and the final day visit to the Temple of Water at Zaghouan. Included in the price is 7 nights in a three star hotel, tours and dinner and lunch as well as transfers to hotels.